Once again, I can thank (blame!) Nouveau Cheap and one of her readers for this purchase! 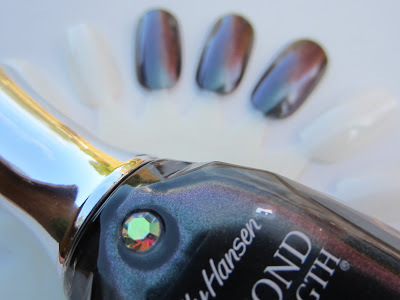 Last night I saw her post here, and I made a mental note to be on the lookout for this new Sally Hansen Diamond Strength display. 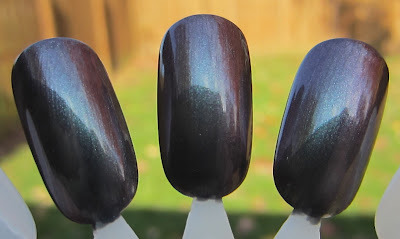 Erika, one of her readers and the owner of the blog Polish Fixation, should be thanked (blamed) as well, for discovering this huge collection! There are lots of new shades in this collection, but the only one I really wanted was Black Tie. 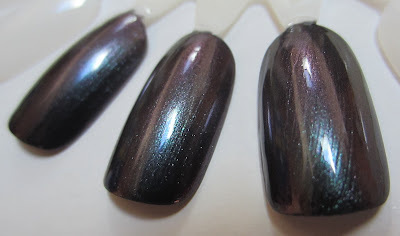 Of course, once I start to see more swatches, I may have to go back for some of those other shades. Black Tie is a purple to deep teal duo chrome that I would say has an average or just slightly below average duo chrome flash to it. 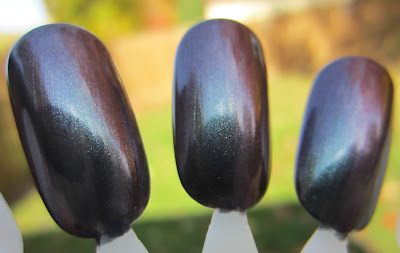 These were all taken outdoors in some shade to show the duo chrome, but when I had the nail wheel in full sun, it looked to be a purple shimmer with little to no duo chrome. That's why I rate it a little below average in the duo chrome department. It's still a gorgeous polish, and I love these two colors together. These are priced at $3.98 each, and I found the display at Wal-Mart. I used two coats on the nail wheel, and from that limited use, the formula seems to be fairly pigmented and easy to work with. Have you spotted this display yet? pretty kinda reminds me of Misa "It's You". got to see these babies in person~love the new bottle. Hmm, kinda reminds me of Borghese Stellar Notte! Reminds me of Stellar Notte too! Could this be a dupe? It's my daughter;s favorite color!